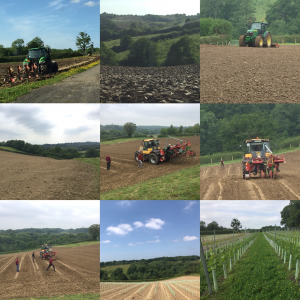 2018 saw the completion of our final planting, with 7,250 Chardonnay & Pinot Meunier vines planted in our Great Gale field. Great Gale got its name from the storm of 1703 which cleared the trees that once stood on this spot. The German & Polish planting team arrived 4 days early, throwing us into some confusion, but we managed to get the vines out of cold store, roots soaked in water and trimmed, and the field harrowed in short order. Rain threatened to interrupt the planting, but the forecast afternoon deluge arrived a nip-and-tuck 15 minutes after we had finished planting. We planted 5,250 Chardonnay vines from 3 Champagne clones & 2000 Pinot Meunier vines from 2 Champagne clones. This gives us the perfect balance of grapes across our two vineyard holdings. Alternately, sunny, warm and wet weather followed in the weeks after planting, which was ideal to get the baby vines bedded in. This is our final planting, taking us to over 30,000 vines on 30 acres. It is also the most densely planted plot, with 8000 vines (750 planted last year) on 6 acres. The vines are 90cm apart and will be trained to single guyot. After planting, our top team of Plumpton students walked painstakingly through the vineyard, row by row, pulling the vines upright to ensure that their roots develop optimally, placing vine tutors next to each vine to support its growth, and inserting vine guards over each one to protect it from rabbit damage. You can follow the stages in the planting of this vineyard, from ploughing to harrowing, planting to placing vine tutors, guards and trellis. in the Mosaic of photographs below.